If you are in the health industry and offer an array of health services to your clients, it is imperative for you to create and document numerous kind of health forms to ensure that your customer’s data is valid and secured. 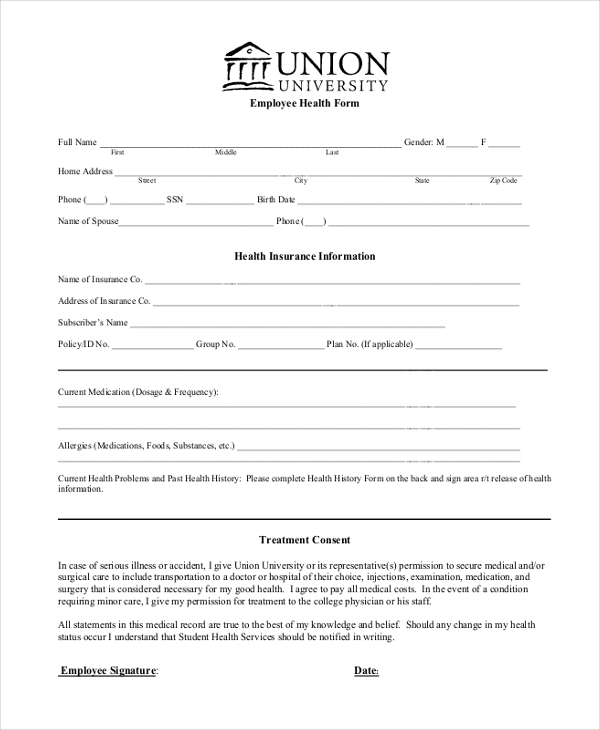 Health forms are also used by the HR department of business organizations to ensure that their employees are able to remain in the best of health and can claim any required medical assistance they have been signed up for. 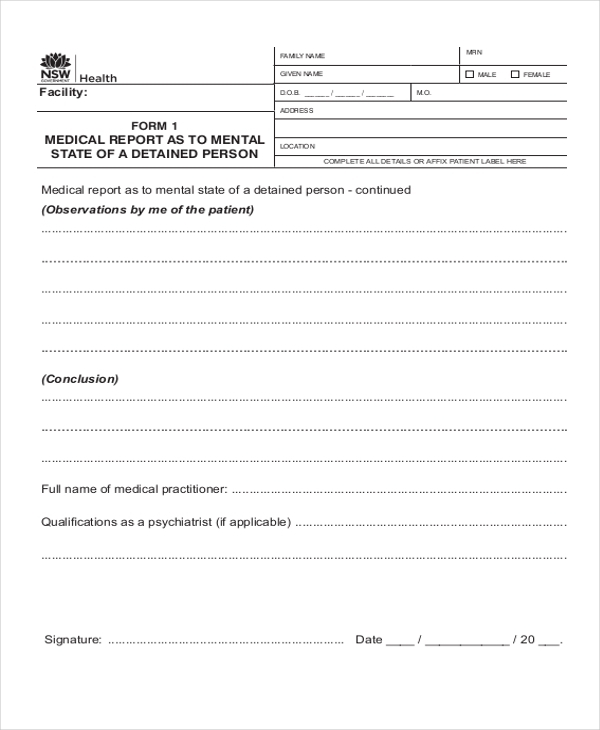 This form is used by medical practitioners to report the details of the mental state of a detained person. 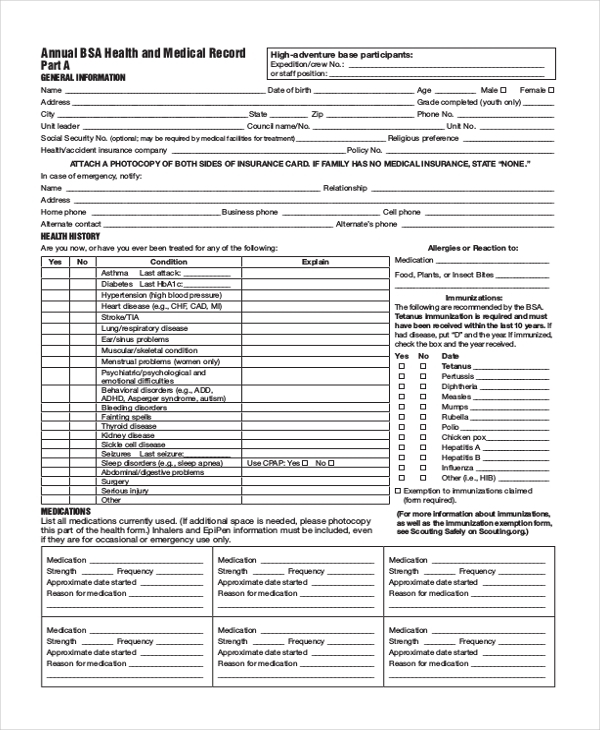 This form serves as a formal medical document furnished by a medical practitioner. 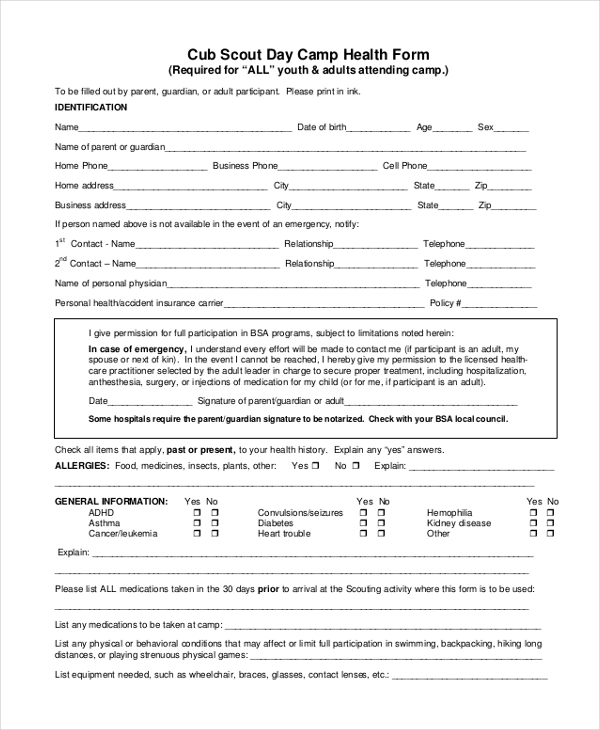 The BSA Health Form serves as a health history and promotes health awareness, collects necessary data and provides medical professionals critical information needed to treat a patient in the event of an illness or injury. Employee Health Forms provide post offer pre-employment health and medical screenings for all employees to satisfy the health clearance requirement of the enterprise prior to the start of their work. Occupational health ensures that healthy and happy are fit enough to perform a particular job. 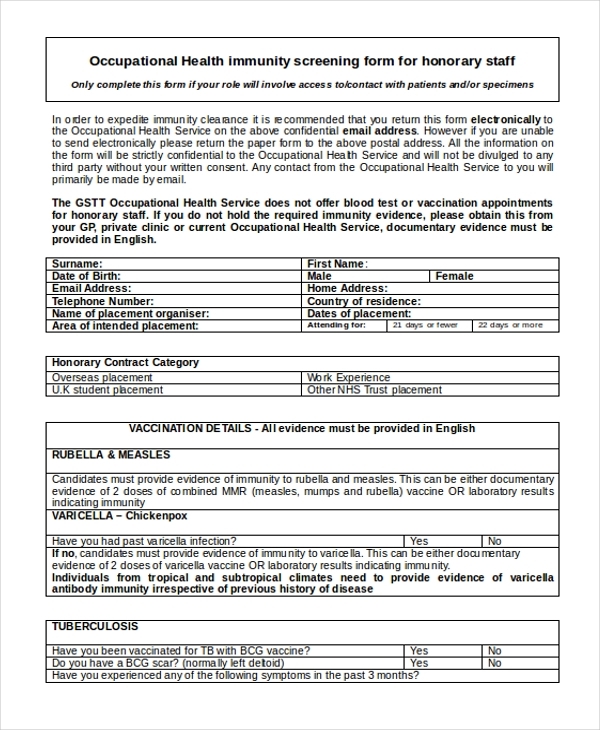 The object of filling in an occupational health form in an enterprise is to ensure that the proposed work does not damage or compromise their health. The Scouting adventure, high-adventure excursions, camping trips and having fun are important to all those who scout frequently. And so is your safety and well-being. Therefore, the scout health form is an imperative document for tracking the health of the scouter. 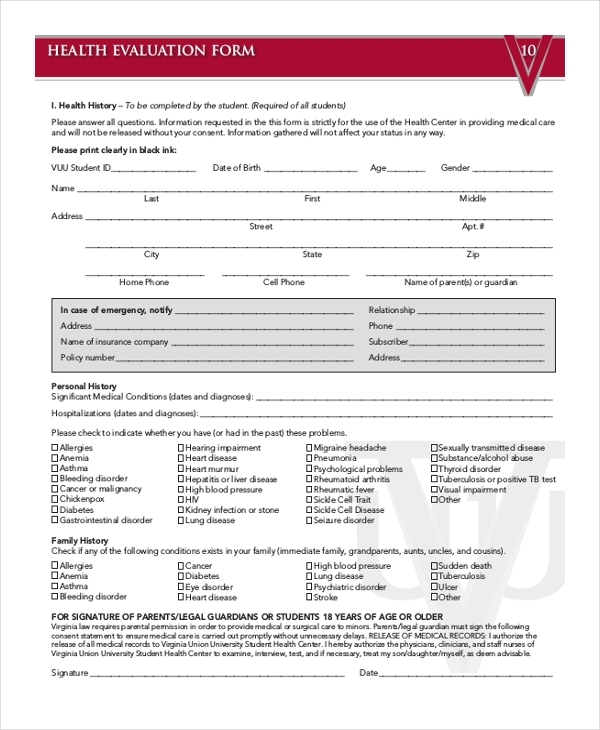 Every school or university mandates the filling of the student health form to be aware of their medical background so that appropriate actions can be taken in case of an emergency. 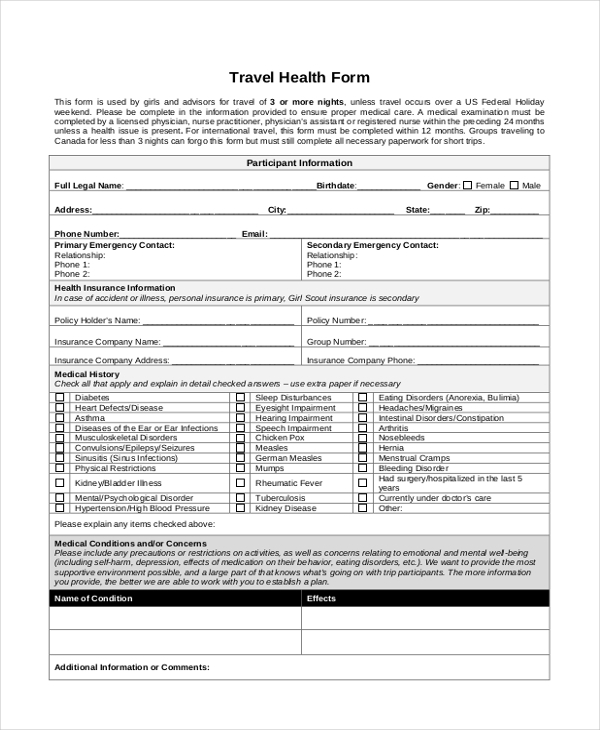 Travel Health Forms are in place for individuals who are traveling for more than three days. This is to ensure that proper medical care is imparted to a traveler in cases of emergency. 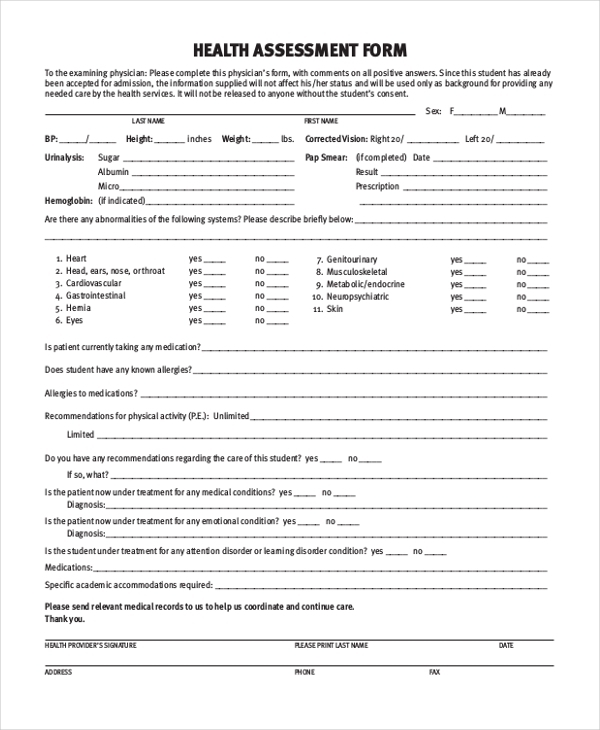 The Health Assessment Form is a mandatory document which is used to fetch the background health information of all the students of schools and universities for providing any needed care by stipulated health services. 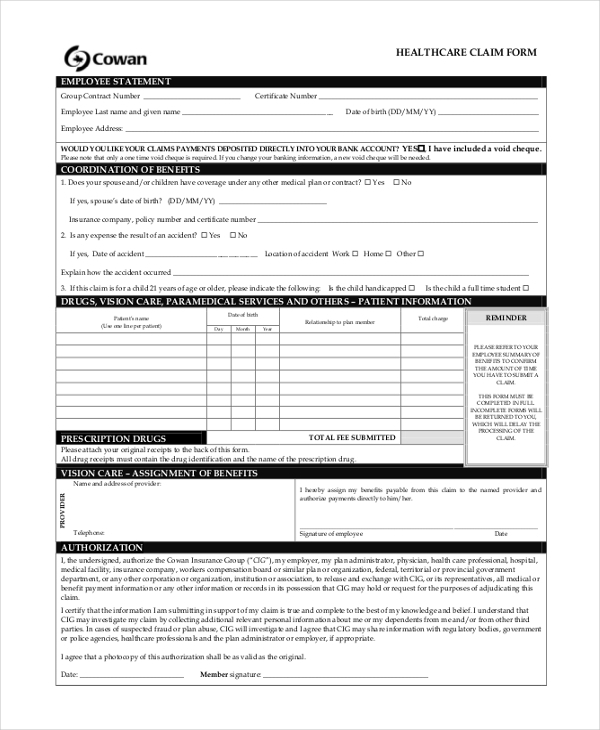 The Health Appraisal form is a documented record of the health history which includes immunization, physical exam and medications required for new entrants of job or training, students or sports persons. 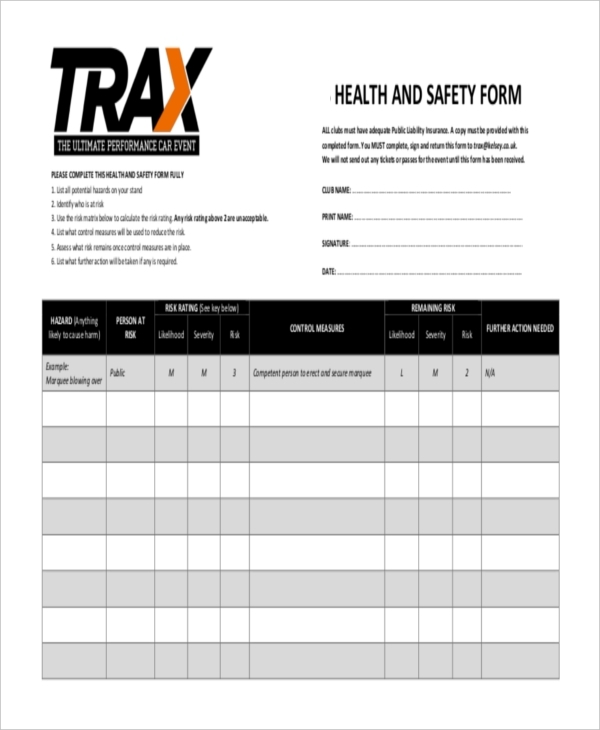 This form is used to document the health, safety hazards, and the corresponding control measures for the employees at the workplace especially for people who work in iron plants or chemical and oil factories. 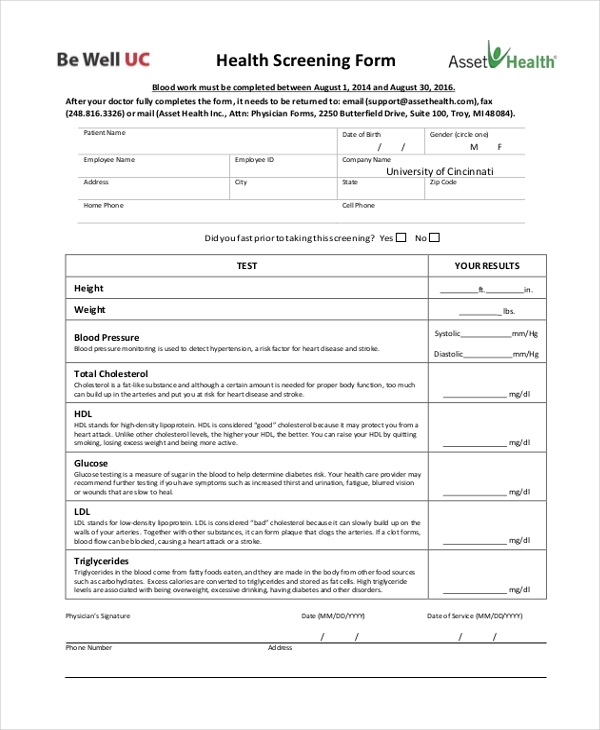 The Health Evaluation form comprises of a written documentation of all the important aspects of an individual’s health such as the health history, physical examination, immunization record, tuberculosis, meningitis and hepatitis in an evaluation form for reference. In order to seek admission in any educational institution, it is imperative to furnish the health history form to render more efficient medical care to the students during their stay at the university and hostel premises. 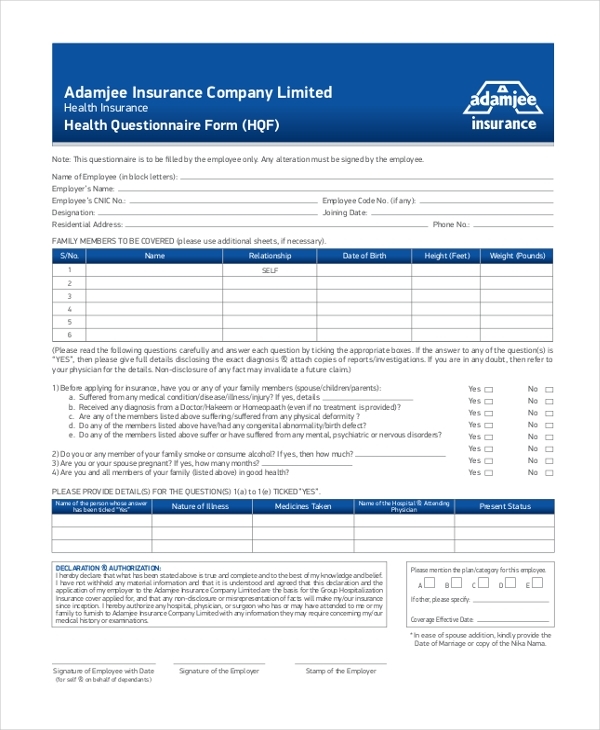 This form needs to be filled in and submitted to your insurance provider along with the copies of your medical and hospital bills in order to claim your health insurance. 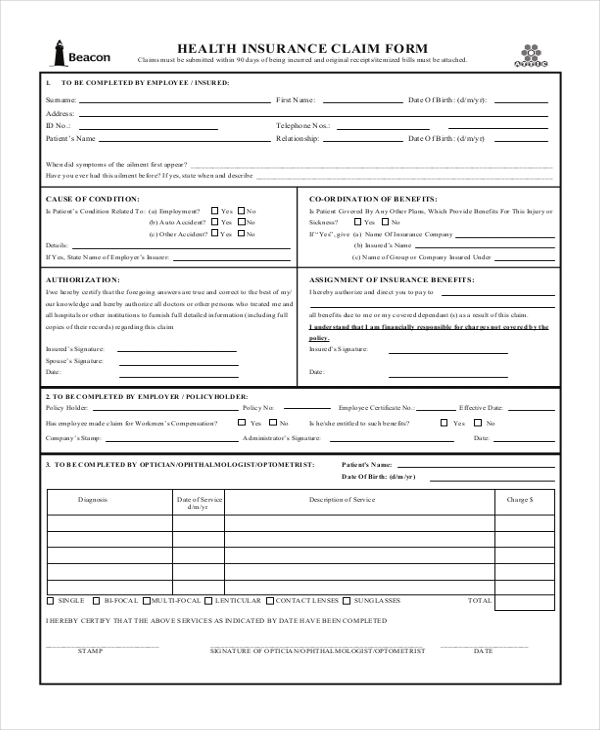 The Health Questionnaire form furnishes you a mandatory form you can use to fill in the personal and medical questions in order to claim for medical benefits from your employer. For admission in any stipulated university, students might be required to complete their health certificate form to provide a detailed overview of their health conditions and to declare the emergency contact details for grave situations. The Healthcare Claim is furnished by insurance companies to process the claims of their customers. It contains important aspects such as identification, coordination of benefits, information about dependants and details about the health spending account. In order to promote physical health and personal well-being, numerous enterprises conduct annual health checkups for their employees with the help of the health screening forms and use it to record and track employee’s health records. 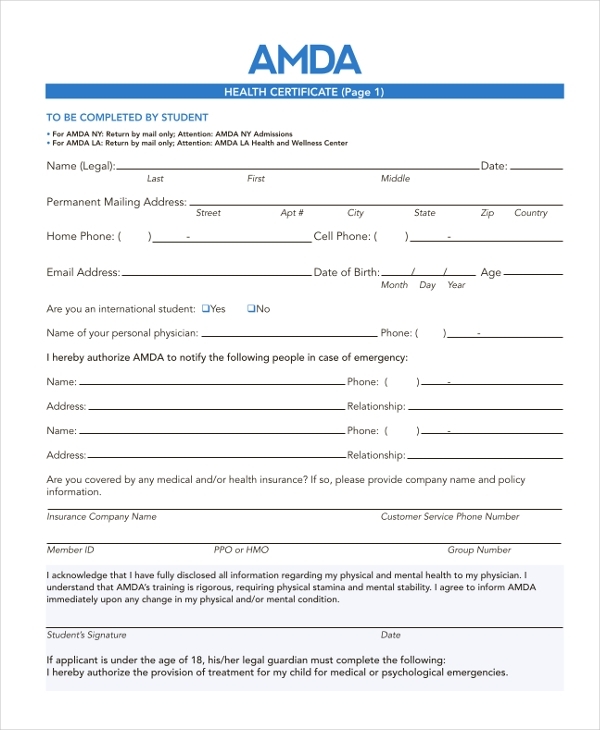 How to Use the Health Forms? All of us have to furnish health forms to our universities, employers, traveling companies and myriad other places to provide a written documentation of our medical background and present health conditions. 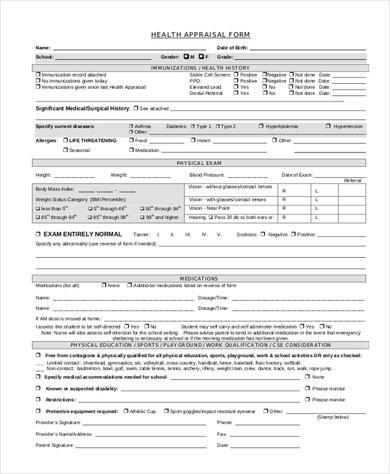 Health forms are robust templates and are predominantly used by applicants and candidates to provide detailed information about their vaccines and immunizations, past illnesses, allergies or any past medical history. The health forms can either be filled by hand or typed out neatly to provide, clear and crisp information about your health. 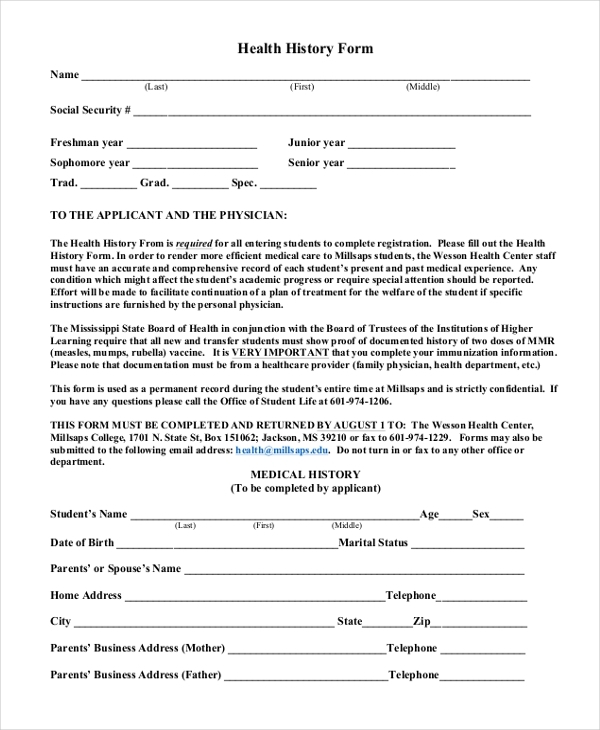 Health forms are official documents and it is mandatory by law for educational and financial organizations to keep the medical records of their students and employees respectively. What are the Benefits of the Health Forms? Health forms had a widespread importance and popularity in our daily lives. They are one of the most important documents to be maintained personally, in educational institutions as well as with the employers and insurers. Physical health examination certificates are mandatory for adventures, scouters, travelers, and sportspersons. The Health forms not only assist in maintaining and tracking health and medical backgrounds of individuals but can also be furnished while submitting substantial medical claims to your insurance company. Assessing, documenting and maintaining health forms are imperative by the law and they come handy especially in cases of sudden medical emergencies. 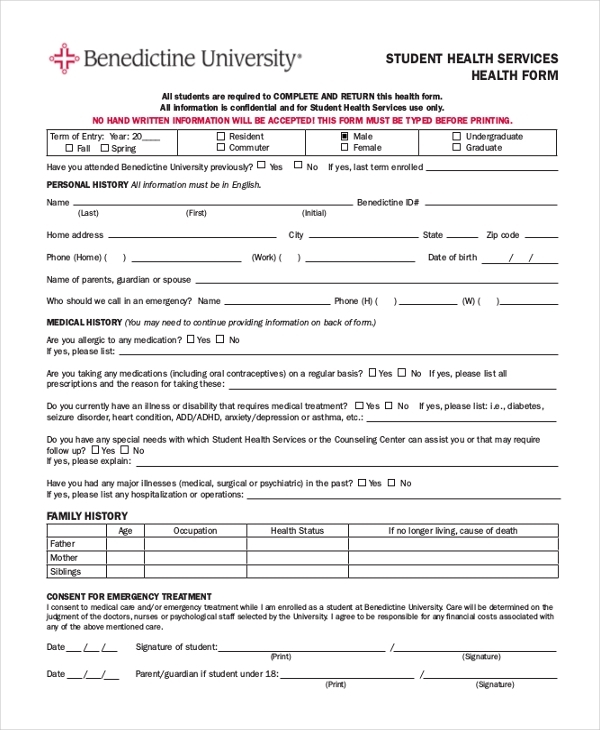 If you belong to the health industry and looking to create professional health forms to service your customers, you can seek help from the health form templates available at sampleforms.com which are simple but professionally designed templates created for you to download and edit so that you do not have take the hassles of creating such documents from scratch.